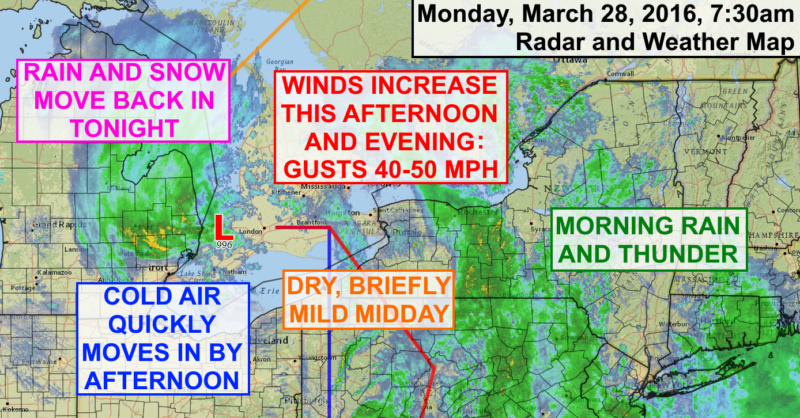 A strong storm will bring a variety of weather to the Finger Lakes on Monday to kick off a windy, active week. This storm is tracking east northeast and will move from near Detroit this morning, across Lake Ontario this afternoon and into northern New England on Tuesday. Out ahead of the storm, a band of rain and thunder is moving through the Finger Lakes Monday morning. This rain will push off to the northeast this morning, leaving a dry period around midday. During this time, temperatures will peak in the low 50s before the cold front quickly sends temperatures tumbling. Winds area already gusty, but will only increase this afternoon and evening. Gusts of 50 mph will be possible, which has prompted Wind Advisories to be issued for the entire region. As the low passes by to the north, precipitation will move back in late this afternoon and evening. With temperatures dropping into the 30s, what starts as rain very well mix with or turn to snow. Accumulations should be limited to the higher elevations, but in those areas, a couple of slushy inches may fall. Precipitation should end near midnight, and by Tuesday morning, skies should be clearing. Tuesday will be sunny, but deceptive. Temperatures will struggle to reach 40 degrees, and winds will continue to gust over 30 mph, making it feel raw and bitter despite the sunshine. Winds will die down for Wednesday and the temperatures will return to the 50s. Clouds will already be increasing again as another storm takes aim at the Great Lakes. This system should track a bit further north and west. Winds will increase again for Thursday and Friday, but will probably be just a bit less than today’s wind. Temperatures will remain in the 50s both days along with some rain, mostly on Thursday. The cold air will make another run at us this weekend as a system moves by on Saturday with some showers. Snow will be possible in its wake on Sunday and Monday, with well below normal temperatures.